An operation is under way at a Lancashire harbour to contain diesel which has leaked into the sea from a sinking dredger. 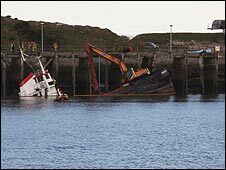 The 34m (111ft) vessel, Abigail H, was moored at the north Quay at Heysham, but started to take on water and has sunk halfway into the water. A quantity of diesel has leaked although it is thought to be only a small amount. Fire crews are at the scene along with police and the Environment Agency. Abigail H is a 160-tonne dredger which is used to clear the harbour to ensure the safety of ships passing through. Lancashire Fire and Rescue Service (LFRS) said it was unable to pump the water out because it was still filling the submerged compartments. Equipment to stop the spread of the fuel has been set up around the vessel, before salvage crews arrive.